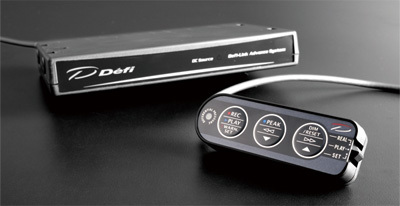 Defi-Link ADVANCE Control Unit is necessary to operate ADVANCE gauges and displays. The production of DF07701 has been ended in December, 2011. DF07703 was released in February, 2012 with some functions added. Please refer to the specifications for the detail. *Defi-Link ADVANCE Control Unit is expressed as ADVANCE Control Unit or ADVANCE unit. Power source indicator (blue LED) assures correct wiring. ADVANCE Control Unit is threadably mountable. When using ADVANCE Control Unit, please purchase ADVANCE gauges and displays additionally.